towards a more nuanced and useful understanding of fan motivations? A global audience of more than 1 billion tuned into the 2014 FIFA World Cup in Brazil, making it the most watched TV sporting event of the summer. For soccer fans, the month-long tournament created a number of indelible memories, including big disappointments from the Spanish and Brazilian teams, Luis Suarez’s infamous bite, memorable goals from Tim Cahill (Australia vs. Netherlands) and Mario Goetze (Germany vs. Argentina), and Germany’s unforgettable match against Brazil. Popular narratives like these continue to cement fandom in sports. However, in an age of participatory media, sports are not the only thing attracting passionate fans and on Nov. 21, 2014, industry professionals, academics, students and other participants gathered at USC’s Annenberg Innovation Lab to explore a new framework for leveraging engagement, one that understands the unique emotional investments of fans in order to better comprehend their motivations and map (or, more pragmatically, predict and encourage) their engagement with media. This Think & Do workshop, Leveraging Engagement, was a step towards creating new projects based on this fan engagement research that could better measure, engage and encourage fandom. Download the Think & Do briefing book here. Think & Do: Leveraging Engagement from USC Annenberg Innovation Lab on Vimeo. Download the Think & Do Recap Book here. The day showcased the Leveraging Engagement research model with an applied research project case study conducted by AIL Creative Director + Research Fellow Erin Reilly, Research Assistants Bessie Chu and Jake DeGrazia, Web Developer Aninoy Mahapatra, and many others in partnership with Havas Sports & Entertainment and IBM during the 2014 World Cup in Brazil. This research project, called Fans. Passions. Brands. (International Football), used surveys, interviews, and social media analysis to identify multiple ways in which international football fans engage with their favorite team. ​The Think & Do workshop used a series of fun, creative exercises to explore how brands and studios could apply those logics of engagement beyond International Football. No stone was left unturned as students and faculty partnered with executives from IBM, Havas, EPB, BET, DirecTV, FOX, and others and imagined ways to re-connect audiences to other areas of media and entertainment. Technical Director & Research Fellow Geoffrey Long served as the ringmaster for the all-day workshop, co-designing the overall game/exercise and emceeing with sprightly humor and pop-culture jokes. 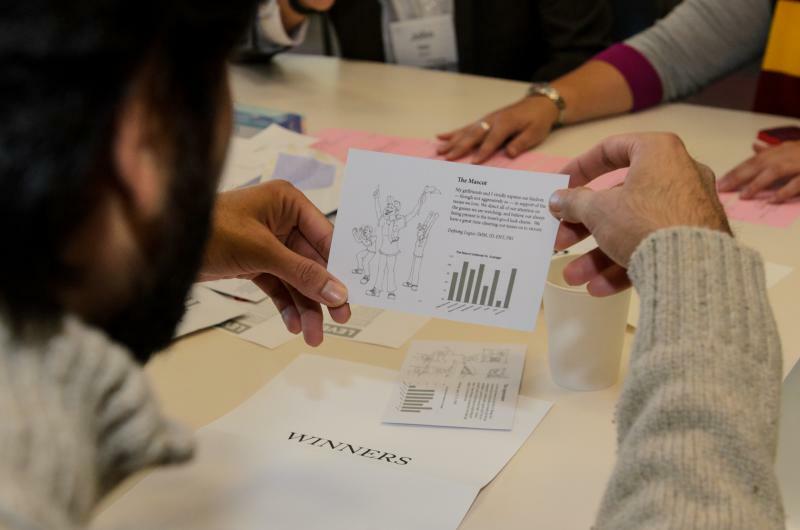 Throughout the day, participants examined individual logics and brainstormed how they could be incorporated into a multitude of consumer-facing industries such as movies, music, scripted and unscripted television, politics, and fine arts. Contributors acted out skits, explained necessary shifts in paradigm thinking, and even sang a few songs. The mood was lighthearted, energetic, and playful, all while exploring how to go beyond the traditional "four quadrant" concept of demographics towards a broader, much more useful and nuanced understanding of fan motivations. The body of research will be further expanded next semester in a specialty course at the USC Annenberg School of Communications and Journalism, designed by Reilly and Long and overseen by AIL Director Jonathan Taplin. In this course, Leveraging Fan Engagement, students will work with actual entertainment studios’ real-world challenges and brainstorm creative solutions based on research and application of the Leveraging Engagement research model.